Learn how to affordably tackle your home’s maintenance and repair issues with the Community Homeworks Education Program. Regular, proactive home maintenance inside and out helps preserve your home’s value and is a necessary part of providing a safe, secure, and comfortable shelter. When funds are low, small repairs might be put off, but a relatively minor repair left unattended can deteriorate into a major one. Our instructors are eager to share what they know to help you identify, repair, and prevent problem little issues from becoming more serious. 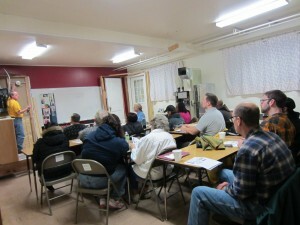 Our classes are organized into 4 main tracks: Tools & Basics, Home Systems, Home Structure, and Outdoor Elements. Topics are offered on a rotating basis, allowing participants the opportunity to choose workshops that meet their needs. Whether you want to understand the basics of how your heating or plumbing system works, or get some practical information on how to tackle basic light fixture repairs, or learn how to add value to your home with energy savings or cosmetic improvements, we have a class for you. Handouts are provided, and many workshops are hands-on, using a variety of props: power tools, hand tools, sink and vanity, toilet, water heater, furnace, windows, door, electrical outlets, faucets, paint and painting tools, drywall, lawnmower, and more. Advance registration is encouraged for all workshops. This allows us to ensure there are enough materials and to call you if there is a change or cancellation. Workshops are open to all homeowners and renters of Kalamazoo County and are free to those who are income qualified. You can register online or by contacting our Education Coordinator at Email or by calling 269-998-3275 (ext. 204).